Starting September 13, 2018 at 1:00 P.M. (PDT), Trainers all over the world will be able to encounter Articuno, Zapdos, and Moltres in Raid Battles until September 20. And if you’re lucky, you may be able to encounter their Shiny forms! We are assuming they will go back to being Tier 5 but… we really don’t know for sure. So we included links to both! Looks like the counters are still the same for either though. Based on level 35, the best counters are the first row with their best move types below. These counters will give high DPS and last a reasonable amount of time in combat. 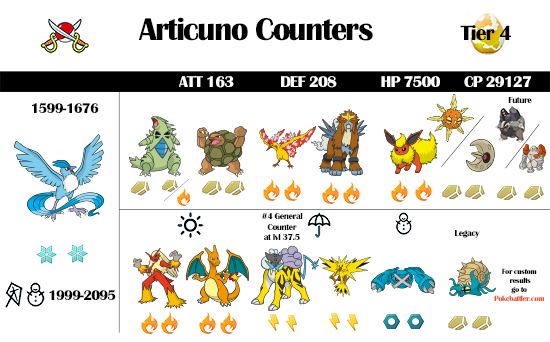 Specific counters in certain situations, such as against certain move type or in certain weather, are listed on the second row. For more specific info with different levels or your own Pokemon, use our custom raid guides linked above. Articuno is making a very brief appearance Saturday, July 7th for 3 whole hours in raid battles around the world. Which is… random. And Pokebattler’s hometown of Los Angeles is having a massive heat wave that day so we’re going to be wanting ice water more than ice Pokemon. Badum Ching. But OK. Since Articuno is a very strong Ice Pokemon it’s worthwhile to catch a few on Saturday if you’ve got the chance. His Movesets: He always has Frost Breath for his fast move. And all his moves are ice no matter what, keeping things pretty consistent. Blizzard – A powerful one bar move that is the strongest if you get lucky. Icy Wind – Not a good move. Tm this away. It’s pretty easy to remember what’s good against Articuno: Rock and Fire. Use your best rock and fire mons, and you’re good to go. Hope you managed to get the new Tyranitar move with Smack Down during the last community day because this double rock Tyranitar is a strong new mon and rocks Aritcuno’s world. He stands out as the strongest mon in many different ways so if you’ve got a few, use all you’ve got! Even a level 27 Tyranitar is likely better than the rest of your options. 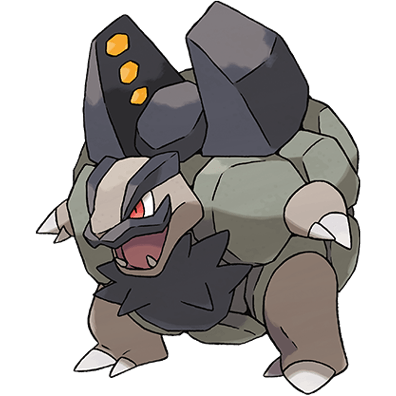 Golem comes in behind Tyranitar to be the second strongest rock mon that kicks Articuno arse. Also note: Alola Golem, although sadly not available for tomorrow, will be an even better counter against Articuno in the future. This strong fire mon is higher DPS but less tanky than his fellow fire bro, Entei. Using our Estimator ranking, this puts Moltres ahead of Entei. But Entei passes Moltres up by level 40. And of course, all the fire bros get a nice boost in sunny weather, which considering it’s supposed to be 100 degree tomorrow in our hood, is pretty likely for us Angelenos. Another strong fire legendary comes in behind Moltres due to being lower DPS, but more tanky. If you’re running low on potions or don’t want to rejoin as much, he’s a good choice. His lesser fire mon still makes a good showing against Articuno. And he’s just so cute. These weaker rock Pokemon still put up a good fight against Articuno as general counters. Sadly these mons aren’t out yet, but they will someday make strong counters against Articuno. And we don’t want to have to keep updating this article all the darn time so we’re putting them in here now. This fire mon gets a good boost in sunny making him useful against Articuno. Once again the community day move Blast Burn becomes useful in sunny weather for double fire Charizard. Raikou gets a nice boost in the rain, but he also has a breakpoint at 37.5 turning him into a number 4 general counter sans any weather boost. So if you’ve got some high Raikou AND it’s raining, he becomes rather powerful against Articuno. Rain gives electric a boost making this higher DPS, less tanky electric legendary good against Articuno, but not as good as Raikou. Double steel Metagross gets a boost in snow, making him decent against Articuno – good for you southern hemisphere players out there tomorrow. People seem to get pissed when we include double rock Omastar on infographics as most of us don’t have him, he was only available for a short time in the beginning of the game. But the fact is, he is a very strong counter for Articuno, coming in behind Tyranitar, if you were lucky enough to save your double rock Omastar back in the day. So we hid him in the bottom corner of the infographic. Please don’t yell at us. Yep, he’s only out for like 3 hours and it’s super random, but Articuno is a strong ice mon that would be killah against a Dragonite raid, if those ever happen. So catch yourself some ice birdies, and if you’re having a heat wave like us, make sure to keep cool and stay safe whilst raiding. Articuno is a good mon, but he’s not worth getting heat stroke for! As always, check out pokebattler.com for custom results! We’ve recently done a redesign and hope things are looking spiffier and are better organized. Let us know what you think of it and make sure you reload your browsers to see the new design! Wonderful info. Does Tier 4 status mean we can place today’s Articuno in gyms? Unfortunately no. Articuno is still a legendary.